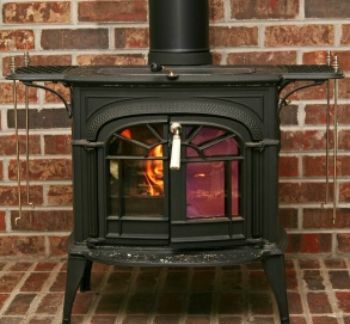 Wood stoves are a popular and excellent way to heat a home with wood. Although similar in external appearance to stoves of the past, modern stoves far exceed older stoves both in efficiency and cleanliness. Wood burning stoves evolved to improve the heating ability of open fireplaces. Early models were reminiscent of what we would call hearth stove today. That is, they were metal boxes with an open back positioned against a fireplace opening. Because they extended into the room, they radiated more heat. By the mid 1700’s, completely closed stoves allowed the fire to be moved further into the room for even better radiation of heat. In the US, Benjamin Franklin is credited with improving wood stoves. His original design was an open-front cast iron firebox – more of a metal fireplace than a stove. However it could be positioned within the room in the room so it radiated heat 360 degrees. Franklin published a pamphlet describing his “Pennsylvanian Fireplace” and extolling its virtues. It became know as a Franklin Stove, even after others improved the original design beyond recognition. Although there were minor improvements over the years, that was pretty much how things stayed for a couple of centuries. Wood stoves remained essentially the same until the late 1980s. During the energy crisis of the 70’s, there was a resurgence of interest in heating with wood that led to many people installing wood stoves. As they became used more commonly, the limitations of the stoves became evident. First they were inefficient. If a person was using the stove as the primary heat source for their home, they required a huge amount of wood. Secondly, they polluted the air. Old stove burned incompletely resulting in a large amount of particulate matter in the smoke. Older stove often emitted as much as 30-70 grams of particulate matter an hour. Not good. Thirdly, incomplete combustion and improper maintenance created a fire hazard. Unburned resins released from the logs exhaust with the smoke. In old-style stoves, the homeowner started a fire and, when it was burning well, cut back the air intake to have the fire smoldering rather than burning briskly. This made for a longer burn and more even heat, but the lower temperature of the fire meant more unburned resins going up the flue. If they cooled enough as they exited, they precipitated as creosote on the inside of the stove pipe. That created a major fire hazard. If the temperature in the stove pipe ever reached the ignition point of the creosote, an extremely hot, dangerous fire the length of the stove pipe resulted. Many homes have been lost to such chimney fires. A lot of earlier stoves were just inconvenient because of design and installation. A friend of mine lived with a stove that had been installed in the late 70’s. The previous owners had it installed on the lower level of a split level house. It was a retrofit, so rather than run the stove pipe up through the rooms of the house to the roof, they had it exit the side wall downstairs and ran it up outside the house. This meant the exhaust gases passed through a stove pipe that was surrounded by cold outside air for over two stories (chimneys have to end well above the roof. If you wanted to design a system to precipitate creosote in your chimney, that would be it. My buddy had to brush that thing out at least once a month. He installed a clean-out at the bottom end so he could do it from the ground, but it was still no fun. I can still hear him muttering about it. Things like that gave stoves a bad name and they fell from favor for a while when energy prices fell. Today’s stoves are a different matter. In the late 1980s, the EPA placed limits on smoke emissions from wood burning stoves to reduce the impact on air quality. The allowed limit is 7.5 grams per hour, and many stoves produce a little as 1-5 grams. This was quite a reduction from previous stoves. The manufactures accomplished this in two ways. The first, and not my favorite, is by using a catalytic plate. This is a ceramic honeycomb imbedded with compounds that catalyze the combustion of resins in the smoke at lower temperatures than they would ignite without the converter. The converter sits in the smoke path. The catalytic converter has to reach a certain temperature to be effective. In use, you start the fire with a bypass damper in the open position. The open bypass damper allows the smoke to flow around (bypass) the converter. Once the fire is going well and the converter has heated up, you close the bypass damper and the smoke now passes through the honeycombed passages of the converter and the contained resins ignite. This manufactures went with this approach first because it was relatively easy to add this to pre-existing designs without a major re-engineering of the stoves. Catalytic converters aren’t my favorite answer for a couple of reasons. First, they’re a bit fussy to use. You have to pay more attention when you’re starting a fire and they sometime interfere with the fire’s draw and need to be adjusted. Second, they’re a maintenance item. Depending on your stove use and the type of wood you burn, they need to be replaced every 2-5 years. Not only is this and inconvenience, it’s an expense. The catalysis generally cost a couple of hundred dollars. I’d rather buy more wood with that money. There are other stoves that burn as clean and efficiently as catalytic stoves without the converter. Non-catalytic stoves use a longer smoke path and secondary combustion to achieve complete combustion. In part, this is similar to the way Masonry Heaters attain complete combustion. The difference is masonry heaters have more thermal mass. The development of non-cat wood stoves took longer because these needed to be completely re-engineered. It wasn't necessarily an easy path. Now that the designs have been well worked out, these stoves are my preference. I like their simplicity in operation. I won’t argue with someone who points out the value of a well-designed catalytic stove as long as they don’t mind working with a little more complicated technology and maintaining it well. Either way, modern wood stoves are an excellent way to add warmth to your home using a renewable resource.